For reasons best known to themselves, the student film society at CWRU has chosen to revive perhaps the least known or hailed big-budget entry in the formidable filmography of Christopher Nolan (MEMENTO, BATMAN BEGINS, INCEPTION, INTERSTELLAR etc.) Perhaps sending a message to the fresh generation of young undergrads now fresh on campus: the economy is terrible, there are no jobs worth s*** waiting for you upon receiving that diploma, student-loan debt will crush you, and very soon everything you’re working on so hard right now will be forgotten. Like this movie. At least that’s what I like to tell students. I consider it somewhat of an ethical civic duty. 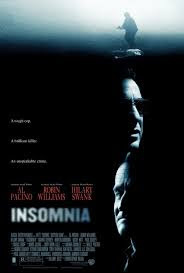 INSOMNIA, from 2003, was Nolan’s rather needless remake of a superior 1997 Norwegian film noir of the same title from director Erik Skjoldbjaerg. The original even starred a Scandinavian thespian with international name value, Stellan Skarsgard. Still, here it was, the chilly material served re-heated a la Nolan. “A good cop can’t sleep because part of the puzzle is missing. A bad cop can’t sleep because his conscience won’t let him.” A credo uttered by LAPD top-cop Det. Will Dormer (a haggard Al Pacino). Dormer shows up his partner Hap (Martin Donovan), off their regular beat in a halibut-fishing village called Nightmute, Alaska, to investigate the bludgeoning death of a teen girl. Why an LA police officer suddenly makes the Arctic Circle his jurisdiction is an unlikely detail Nolan obscures by making Dormer on the run from a scandal back home, where Internal Affairs is threatening to reverse convictions of all the street scum collared earlier in his career. In Nightmute he is at least among friends, hero-worshipping small-town lawmen like young detective Ellie Burr (Hilary Swank), who hangs on his every aphorism and swagger. Dormer takes charge of figuring who killed the Laura Palmer-like victim. Dormer’s judgments and reactions become clouded by the incessant Alaskan daylight, which creates his chronic insomnia. He arranges a trap for the culprit, but in the fog fires a wild shot that instead kills Hap – who, coincidentally, was going to testify against Dormer once they returned to California. Pacino affects a strange accent (Cajun?) but otherwise delivers a decent performance as an alpha-male type caught in a web of his dishonesty, caused to finally question his own motives. Nolan spikes the narrative with staccato flashbacks and strives to milk the setting’s gimmick of unending pale daylight that denies Dormer any respite and illuminates the dark side he tries to hide. Still, David Fincher’s FIGHT CLUB did the whole sleep-deprivation-leads-to-madness bit somewhat better. While the original, better INSOMNIA ended on a haunting note of moral collapse, the USA do-over finishes with a tidier Hollywood ending. A little jeopardy, some action, a final redemption, and you’re free to go. Unlike the Skjoldbjaerg film, that really won't leave your head, or at least it didn't leave mine. Almost like a bad dream. Try to catch that one some time.